I know, a couple of week it was multiple exclamation points, then a reference to lyrics from a band anyone who is remotely cool is trying to forget they ever liked and this week it’s all caps all the way. Hopefully, by the end of this post you’ll agree that, this time at least, the subject left me with no option. 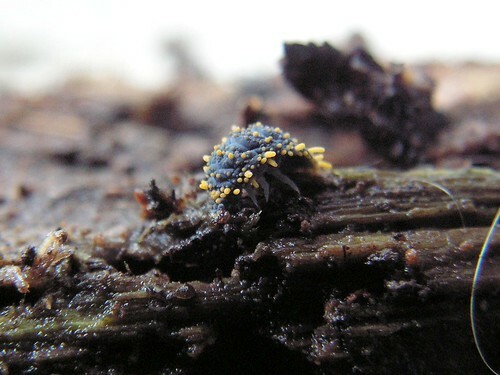 The little grey-blue thing with the bright yellow spikes is Holacanthella paucispinosa, one of New Zealand’s giant springtails. Are you amazed yet? Perhaps you need to know a little more about normal springails before you can appreciate the quiet grandeur of the giants. 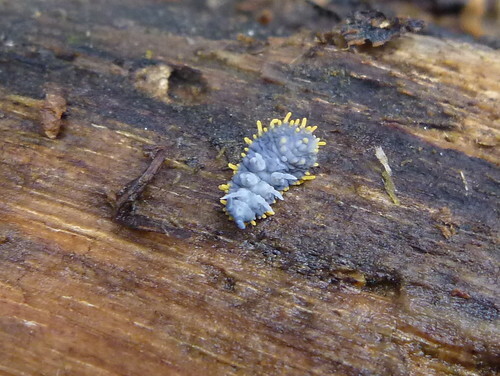 I’ve writen about springtails (also known as Collembola) before, but they’re animals that are worth two takes. Springtails are small, six legged arthropods which live mainly in the soil and leaf litter and such moist habitats. This might be the first time you’ve heard of them, but they’ve been around you for your whole life. They live on every continent (including Antarctica) and there are as many as 100 000 of them in your average square metre of soil. If you were to go outisde now and pick up a clump of soil from your garden or your lawn you’d almost certainly see a bunch of tiny elongate or globular creatures crawling around and, a few seconds later, vaulting off into the air. That bouncy behavior is achieved with an organ that is neither a spring nor a tail. It’s called the furcula (meaning “little fork”) an it is held under tension under the abdomen. When a springtail senses danger it can release the furcula, driving it into the ground and flinging the animal away from the threat. The tiny white thing in the upper left is a pretty big springtail (for North American readers, a New Zealand 50 cent coin is almost exactly the same size as a quarter). I didn’t think to add something to provide scale in the H. paucispinosa photos, but that springtail would happily cover the “50” on the coin. H. paucispinosa‘s big cousin from up north, H. duospinosa, would cover a good deal more than half the diameter of the coin. New Zealand has a fair few giant invertebrates. Every time I introduce myself as someone who studies snails I get asked about the giant carnivorous Powelliphanta (I study small snails that eat plants and are generally considered less cool). Then there’s flax snails, weta, the glorious giant bush dragonfly (kapokapowai) and a one and a half metre long long earthworm. The Holacanthella usually get missed off the list of New Zealand giant invertebrates, even though they are many times larger than most of their relatives. I’ve done my bit in trying to fix that. These are the springtails I mentioned spending a summer looking for in my previous post. I did a summer studentship with Mark Stevens from Allan Wlison Centre in which we collected new samples from all over the country to get a gauge on just where they live and how they are doing. We published some of our results in the New Zealand Journal of Zoology . As you might have guessed from our paper’s venue, we didn’t present any earth shattering new results. Instead, we laid the ground for anyone that wanted to do some more detailed studies of these creatures. We looked at all the currently described species in museum collections (Te Papa has pictures of two of the type specimens online) and in our new specimens and found that the existing key, the algorithm by which someone can identify a specimen to a species, didn’t quite work. Some of the characters that were meant to diagnose species were found in some individuals of all species So we updated the keys, and presented updated data on the distribution of each species (there were only 18 locality records published when we started). Together, these results might form the basis of further studies. 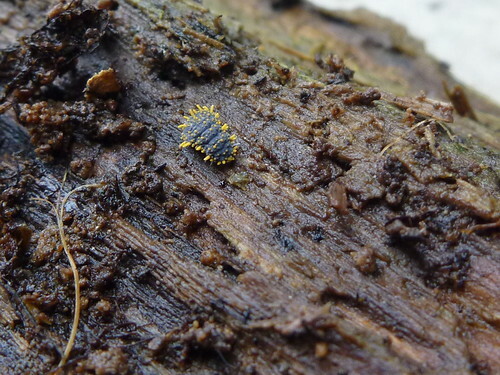 The distirbution of giant springtail species and populations might be particularly interesting, since they are reliant on rotting hardwood logs for life and don’t appear to able to disperse over any great distance. This lack of dispersal ability might mean that genetic relationships between Holacanthella populations might bare the mark of ancient geological and climatic events which have been overwritten in more dispersive animals. The Holacanthella‘s Australian cousin, the Acanthanura (which it’s my patriotic duty to point our aren’t quite as big as our giants.) have been used to infer small patches of forest that survived the last ice age. Their reliance on hardwood also makes the New Zealand’s giant springtails interesting from a conservation point of view. We spent a lot of the summer in Wellington’s hills looking for H. spinosa which was recorded all around the city at the turn of the 20th century. Most of those forests have been logged, and, though there is plenty of regenerating native bush around Wellington, H. spinosa didn’t seem to survive the logging. By contrast, managed forests around Nelson and the Tongariro National Park had species-rich and dense population. It seems the giant springtails are particularly susceptible to changes in their forests. In fact, we even suggested that the presence of giant sprintails in a forest patch can be used as a marker for forest health (“canaries in the undergrowth“), in which case the City Council should be pleased to learn they are living in the little forest fragment I found these guys in! I’m sure there are people think that our little paper on these creatures forms part of the “avalanche of low quality research” that is ruining everything for everyone. But, I can’t tell you how many fascinating talks I heard at the Evolution meetings about the apple maggot fly, the three spined stickleback and the wild monkey flower. None of those creatures are any more likely an imoprtant model for evolutoinary biology than there names suggest, the only reason it became apparent that they represent important natural experiments is because people did the ground work, worked out a little about these species and published it in a small journal. There will probably never be a Nature paper out New Zealand’s GIANT springtails, but you can’t know that before you do the research! Oh, I guess I should answer the most common question I get about these guys: I have no idea why they are covered in spikes. Beautiful wee beasties! I’ve seen them alot in my botanical snufflings, but never knew what they were. Cheers! Superficially they remind me of Tardigrades in their bodyshape and general cuddly look.